So it seems I made it almost through July without a post and I thought I should rectify that, since I've generally been doing quite well with spreading the posts out this year. July was busy, as usual. Marking went on for what felt like longer than usual. I went to Portsmouth for a school reunion and to Leeds for the history conference, where I presented a workshop I had no confidence about and got glowing reviews (and was full...go me!) - this sort of thing never stops being a surprise. I finished my teaching job with a couple of great nights out and about 4 crates of stuff. And last week, I went to Italy with Mr Z. We went to the Gargano peninsula, staying in the same hotel I was at with Tutt two years ago. Utterly blissful - peace, sun, hammock, great food, gelato, beautiful views, sea, local wine and our 10th wedding anniversary. Ten years! Coo. 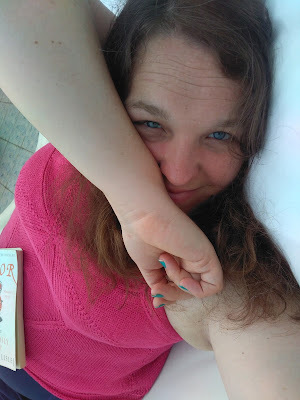 No pictures of him, of course, but this is basically what I looked like for the week when I wasn't dripping in sea water. Now on the Heathrow bus ready to go to Vietnam with Tutt. Very exciting but feeling uncharacteristically nervous. It's so far away! Luckily I have a new book and a new knitting project for the plane. Feeling very fortunate, all things considered!